Sad government collusion with murdering terrorists! 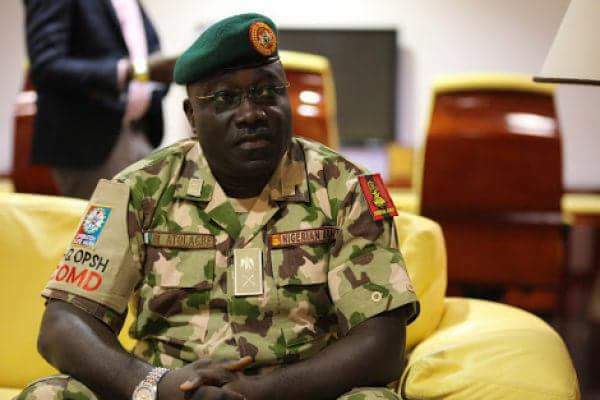 The Special Task Force (STF) commander in plateau state Maj. Gen. Atolagbe has been removed! The Miyetti Allah Cattle Breeders Association (NACBAN) and their Fulani patrons in Aso Rock did this. Gen Atolagbe has served the Nigerian army for about 30 years and about 27 years of this is with the United Nations,he is a professional soldier. He’s problems started when he refused to allow the Fulani terrorists have a field day in plateau state, he arrested 11 Fulani terrorists and paraded them, the first time this happened in Nigeria after they attacked and killed people, he was ordered from above to transfer them to Abuja where they intended to bury the story but he refused saying they should be tried in the jurisdiction of the area where the crime was committed! He went further to arrest another 7 Fulani terrorists and a third arrest of another 7 making a total of 25 high profile Fulani terrorists, including the financier of Fulani herdsmen terrorists in Nigeria who had bank transaction evidence linking him to a lot of higher ups in the country and also he exposed the armourer of Fulani herdsmen terrorists to the General during interrogation, his revelation was to say the least shocking! Gen Atolagbe was ordered from above to stop arresting Fulani terrorists and release the ones arrested to ogas at the top but he refused,saying justice must be served. Just yesterday (July 23, 2018), he was invited to the National Assembly where he said he could soon be relieved of his post but that he would always stand by the Truth.. It happened today! (July 24, 2018). He had used advanced finger prints technology on the bullet casings used by the Fulani terrorists to apprehend them,a technology I learnt he bought with his own money after the Defense HQ refused to get it for him! All for his quest for justice! It is now glaring that the Fulani herdsmen terrorists have godfathers in Aso Rock and can kill Nigerians anytime and anywhere and get away with it! Nigerians must rise up and say no to this Buhari govt sponsored Fulani expansionist movement! My name is Adebayo lion Ogorry and I have said my mind! ← Christian ex-magistrate given leave to appeal.